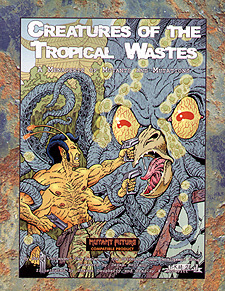 A foreword by Derek Holland, author of several licensed Mutant Future sourcebooks. 50 new creatures, including the mysterious Ahas Folk, the insidious Egret Puppeteer, and the fearsome War Baboy. 30 new mutations, including numerous Plant mutations. Official Mutant Future Poison and Radiation Tables for convention of reference. Original illustrations by fantasy artist Sharon Daugherty.